Harvard Square is one of the most walkable neighborhoods of Cambridge, offering a great deal of visual stimulation and several destinations in a small area. Conventional wisdom says that smaller city blocks are better for pedestrians. Research on urban form has traditionally suggested that smaller city blocks are better for foot traffic, and prominent urbanists have advocated them as key promoters of pedestrian access. Urban planner Leon Krier pointed to the enhanced diversity and complexity of activity generated by smaller city blocks, while the late activist Jane Jacobs noted increased interactions and encounters among pedestrians on smaller grids. But the relationship between block size and walkability appears to be more complex and variable than previously thought. In some cases, researchers now say, larger city blocks may actually be better for pedestrians and communities. Andres Sevtsuk, assistant professor of urban planning at the Harvard Graduate School of Design and director of the City Form Lab, and co-researchers Raul Kalvo and Onur Ekmekci recently reached this conclusion in research published in the journal Urban Morphology. They analyzed a number of well-known cities for their current and potential walkability. They found that while Portland, Ore., could see walkability increase with larger blocks, it turns out that New York City’s street plan, laid out in 1811, remains near ideal. Sevtsuk talked with the Gazette about how city plans shape the pedestrian experience, and where this research could go in the future. GAZETTE: How do urban planners define walkability, and what about walkability and city blocks do you study in your research? SEVTSUK: Walkability is a complicated term. It’s like sustainability. It’s an umbrella term, and there’s a lot going on underneath it. But generally speaking, researchers agree that there are at least two critical ingredients to any environment being walkable. First, an environment has to offer destinations to walk to. Second, walking paths have to be comfortable and safe. In the urban design and planning professions, there is a widely shared belief that for walkability, smaller blocks are always better. This assumption is so common that many transportation studies, too, use urban block size as a predictor for walking activity. We wanted to question that, and find out if that really is the case, and what’s at play here. There are surprisingly few studies about why particular dimensions have been chosen, historically, for different urban grids. If we look around the world, they come in enormous varieties. GAZETTE: The idea that smaller blocks increase, or enhance, walkability, accessibility — to me, this seems intuitive. What features of smaller blocks have fueled this assumption? SEVTSUK: There’s a couple of things at play. First, if you look at individual walks through a city from one person’s point of view, then smaller blocks always help shorten the walk. If you go from point A to point B through an urban grid, and the blocks are short, you can zigzag right through. But what’s good for individuals is not necessarily good for the community. Part of what we look at in our recent paper is collective access for everyone, not just individual walks. That’s where the conventional wisdom goes astray. The smaller your blocks, the more total perimeter you usually have. This perimeter could be activated through retail and commercial facades, and the more of that you have, the more animated or interesting an area tends to be. But if you take that to an extreme and have many tiny blocks, you start spending more time crossing streets instead of actually walking in front of stores. That’s where smaller is no longer better. Another aspect, which has captivated urbanists historically, is that city centers always have smaller blocks than outside areas. Block sizes tend to get bigger and bigger as we move from the city center out. That’s largely because the city center usually has the highest densities and highest land values, so circulation has to be really effective to handle that density. GAZETTE: You just noted a fairly important distinction: individual benefit versus collective benefit. SEVTSUK: Right, and I think that’s exactly where a lot of urban designers get it wrong. Jane Jacobs is right in saying that I could have a shorter walk in Manhattan if its blocks were half as long. If I were going from one particular metro stop to a particular restaurant, with blocks half as long as they are now, chances are my one walk to that restaurant would be shorter. But if our goal is to maximize access to all destinations in the area, then smaller blocks would produce more frequent street crossings, and we start sacrificing some of the useful destination frontage to not-so-useful street crossings. That’s what starts bringing down the collective usefulness of small blocks. What’s really interesting about block sizes is that they have a nonlinear effect on pedestrian accessibility. It’s not that larger blocks are better, or smaller blocks are better. The ideal blocks size for maximizing pedestrian accessibility varies according to the parcel and street dimensions that are used. With the large parcels used in the Adelaide grid in Australia, for example, the grid would be more walkable if it its blocks were half as long as they are today. Portland, Ore., on the other hand, was laid out with relatively small parcels. We discovered that Portland’s grid would have been more pedestrian-accessible had its planners made blocks more than twice as long as they are today. But after a certain size threshold, if your block gets longer, then we start, collectively, not getting access to as many destinations within a 10-minute walk as we could, at the peak. When a block gets shorter below the same peak, then we start crossing too many streets. There is a kind of critical block-size threshold below which we start spending too much time crossing streets. GAZETTE: What cities in the United States and around the world do you and other planners consider particularly walkable? SEVTSUK: It’s interesting that the feeling of what is walkable, or what people think is walkable, depends not only on the ground layout of those cities but also on the uses and buildings that have come to occupy the ground layout. We have to keep both things in mind when we talk about experiences of grids. In the best of cases, the ground layout has created preconditions for a good activity mix and good building forms to occupy it. Manhattan is probably one of the most walkable environments in the whole world because the sheer amount of destinations that are accessible to anyone in a five-minute walk is just phenomenally high. Even if you ignore the vertical dimension of Manhattan, the horizontal density of the grid from the get-go was planned such that you just get access to so many more parcels within the same 10-minute walk than you do anywhere else in the world. Other city grids around the country are relatively small and offer decent, walkable block sizes. Portland, Ore., is very walkable; parts of Washington, D.C., are very walkable. Minneapolis, Minn.; Savannah, Ga. But in some cases, the walkability contribution does not necessarily come only from the ground layout, or the grid. It can come from conscious planning of pedestrian-oriented destinations or public transit that serves the urban core. 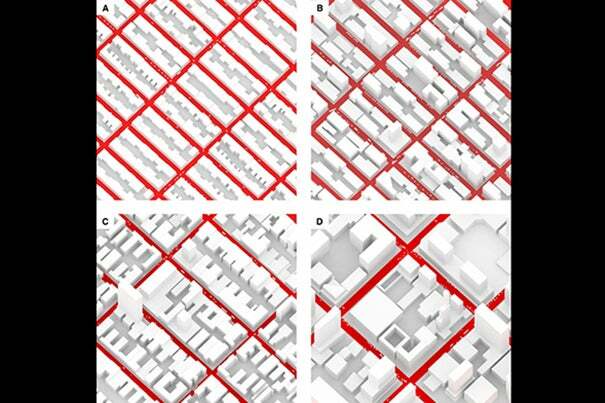 We see very crowded and heavily walked streets in places that are not necessarily, from the perspective of the grid, set out in ideal dimensions. But I think the confluence of walkability benefits arrives when both the ground layout and the built form harmoniously produce an environment that’s both horizontally and vertically accessible, in terms of its programming. Manhattan happens to have all of these factors. GAZETTE: The Manhattan block length, which was laid out in 1811, has turned out to be almost optimal for pedestrian accessibility today. Given the drastic social, cultural, economic, and other changes that have taken place since the early 1800s, what aspects of walkability have been stable and constant enough to permit a plan that was made in 1811 to remain equally favorable today? SEVTSUK: Whenever grids have been historically established to start a new settlement or to plan an expansion to a settlement, there is this critical question at the outset: What timeframe shall we dimension this grid for? Shall we dimension it for our needs right now? That usually means that we need to build larger blocks, because at the very first phase of development, you don’t have high densities, and thus the number of people who can pay for the infrastructure, the tax base, is lower. But what Manhattan did is plan a very generous grid that could handle extreme densities 100 years later. It laid out an extremely fine-grained grid meant for much higher densities than the first phases of development that occupied that grid. Manhattan took a gamble to the future and envisioned a grid that was optimistic in terms of city growth from the get-go. It handled that gamble fairly well, because the grid grew gradually from the densest parts out. It didn’t get occupied all the way into Harlem immediately. It gradually expanded, and the density was following the grid. If you see some of the historic photos of the New York commissioners’ grid, it initially had one-story cottages on these parcels. Now we have 100-story buildings on similar parcels. Fairly soon after the grid was laid out, multistory buildings started appearing, making the infrastructure investment worth the while. But in other cases, in Australia for example, you have urban grids that, for very new settlements and low densities of inhabitation, consist of very large blocks. Economically, that makes sense at the outset. What happens over time with those blocks is that they start getting subdivided as the city densifies. New cross streets need to be cut in to make the grid more accessible, generating smaller blocks over time. Manhattan never had to really do that. GAZETTE: Globally, are there cultural patterns here, with certain cultures historically favoring certain block dimensions? SEVTSUK: Indeed, I think there are cultural, and I might even add technological determinants that have historically guided the choice of block sizes. If you go all the way back to monastic societies, you will find that there have been blocks that were more determined by religious and celestial influences. In more recent history, a lot of block sizes have been determined by the car. If we look at L.A., we see a gridiron environment with not just one large grid, but lots of different, smaller grids. This is dimensioned for the efficiency of the car, so that you don’t have to stop at red lights every half a minute, and you have a certain efficiency that you can drive to the next big arterial road. What we argue in the paper is that the times are turning again. City planners are interested in walkability rather than drivability. If we are wanting to make urban blocks more walkable, then we would not do the kinds of superblocks that L.A. was based on anymore. There has been a lot of energy and enthusiasm for more walkable environments in the last decade in American planning. Europe has never really lost interest in the pedestrian environment. Traditional European city centers have always been relatively walkable. It has to do partially with the fact that there has been a demographic shift in America in the last decade, with the rise of the millennial generation and statistically more people being interested in moving back to city centers. Along with that interest to move to the city center comes a collective interest toward more walkable environments. The average American does not walk that much — but if you look at people inside shopping malls, they park their car, then they spend two hours walking in a shopping mall without noticing that they’re actually walking. This is a very stimulating walk because you’re constantly passing stores and other attractions. People do walk if the environment is conducive to it. As planners, we try to get that same level of stimulation to happen on the streets. We want people to come outdoors and engage with public spaces. You could have a destination a mile away and the walk could be very comfortable, very nice granite paving with nice landscaping along the way. But if there is nothing else along the way to stimulate us, our probability of taking that walk starts dropping. The interest aspect, or the stimulation aspect, of the walks is very important. GAZETTE: With bicycling becoming increasingly popular in cities, does the planning field have an entirely new set of considerations to consider in terms of access? SEVTSUK: Today, the most valued cities and the best-serving cities will maximize accessibility on a multitude of transportation options. We can’t make everybody walk [laughs]. One extreme is Venice: no cars, entirely walkable. You can’t really bike in most of Venice. Even though many of us enjoy going to Venice on a vacation and staying there and walking around, it’s really contriving in terms of other modes of access. Having a city that provides high-quality public transit, that provides a certain level of vehicular access, that has high-quality and safe bike routes, as well as a favorable pedestrian environment, is, I think, what we all would like to see. But what historically has been a huge problem is that some of these infrastructure systems, like vehicular systems, have dominated overwhelmingly, at the cost of the other systems. We have arterial roads and highways in many American cities, and because of them it’s really hard to walk through those cities. The challenge for the 21st-century cities will be to come up with novel and innovative ways in terms of superimposing and managing these different systems at the same time. So that even in a neighborhood that has good vehicular access, pedestrian systems are able to penetrate through that vehicular system and different destinations are connected most readily. GAZETTE: How would you go about testing these theories on the ground, with actual people? SEVTSUK: Most cities collect traffic data, but we don’t do that for pedestrians. What’s pretty exciting today in the type of research that I do is that technology is making the leap. Image-recognition software that can read activity from a simple camera feed and categorize objects that pass by as pedestrians, bicycles, cars, and so forth is becoming readily available. Also, several of the gadgets that we now carry around, like smartphones and watches, have built-in accelerometers that can detect how much we move or walk. This produces very large data sets that could help researchers understand how people’s walking behavior varies across large territories. Former SEAS Dean Venkatesh Narayanamurti has co-authored a new book arguing that the long-standing division between basic and applied sciences is not only financially and chronologically wasteful, but harmful to scientific progress.